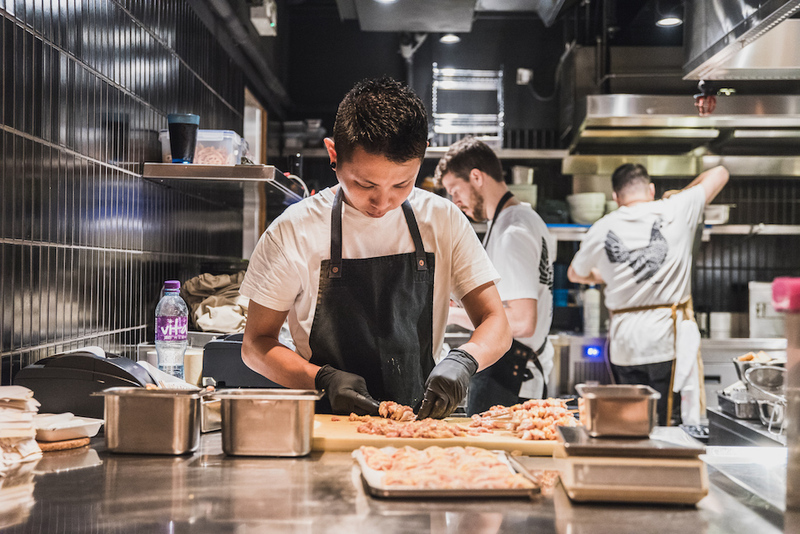 What goes on in the kitchen during restaurant service hours is a bit like a ballet – orders come in from the front of house team, the chefs execute these orders, and the food is sent out at the pass. The key to a successful service is having a good flow, and when the kitchen is backed up during peak hours, organization is essential to ensure that this flow is maintained. Chef Nick preps and skewers parts of the chicken before service at Yardbird. In the kitchen, chefs work quickly at their stations to fire orders, but they’re not exactly cooking each dish from start to finish. To ensure efficiency and consistency, chefs use a mise en place. Literally translated to “putting in place,” mise en place is a French phrase that describes the gathering and arranging of ingredients and tools needed to cook. Chefs start their work early in the day to prepare their mise en place for service. This preparation covers everything from cutting vegetables, preparing garnishes, making sauces, and cooking ingredients sous-vide. When dinner service begins, the chefs can then arrange and assemble each dish quickly. If the mise en place is organized and every ingredient is covered, a chef should be able to assemble their dish blindfolded, since each ingredient is consistently placed in the same spot. And while a complete mise en place isn’t necessary for home cooking, it definitely helps with meal preparation and execution during a busy week. Cutting vegetables in advance and cooking certain items and freezing them beforehand can help maximize your time so you spend less of it cooking and more of it focusing on everything else!